Recently I have been inspired by some 70s style fashion. I am all about the comfort of t-shirts and jeans, but to kick it up a notch in the style department I am giving my tops some fun twists. 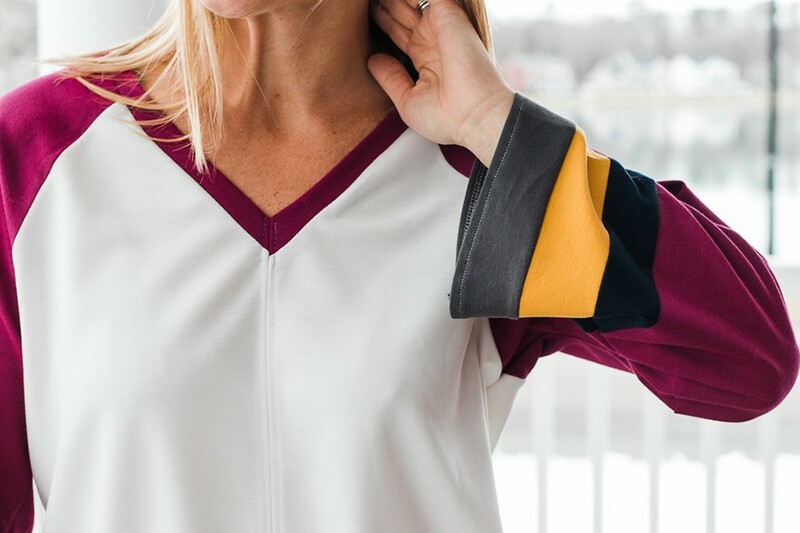 From a slightly bell sleeve to added finished seams, I am loving trying out fun sewing styles. This is one of my more recent creations, that I was inspired to create a tutorial for. A retro style 70’s v-neck shirt, with a triple band slightly belled sleeve. 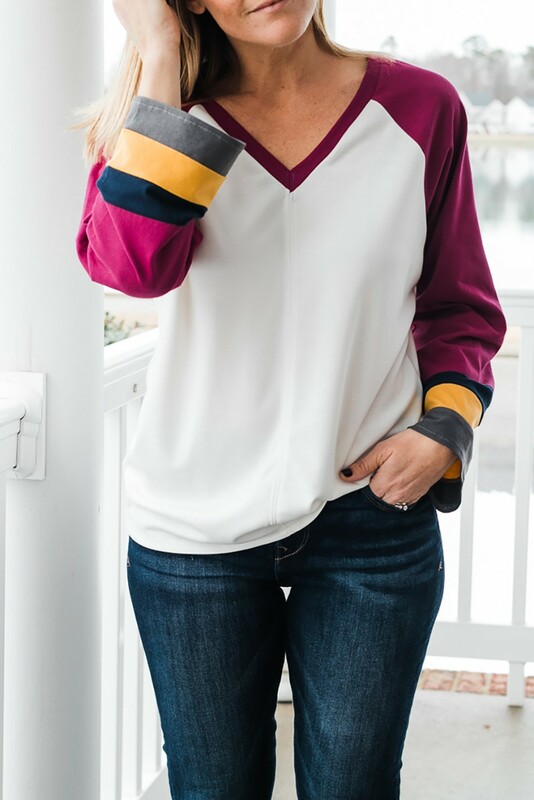 To make the V Neck super easy, I decided to add a front center seam up the shirt, which literally makes this shirt a no-brainer. Let me show you how it’s done. 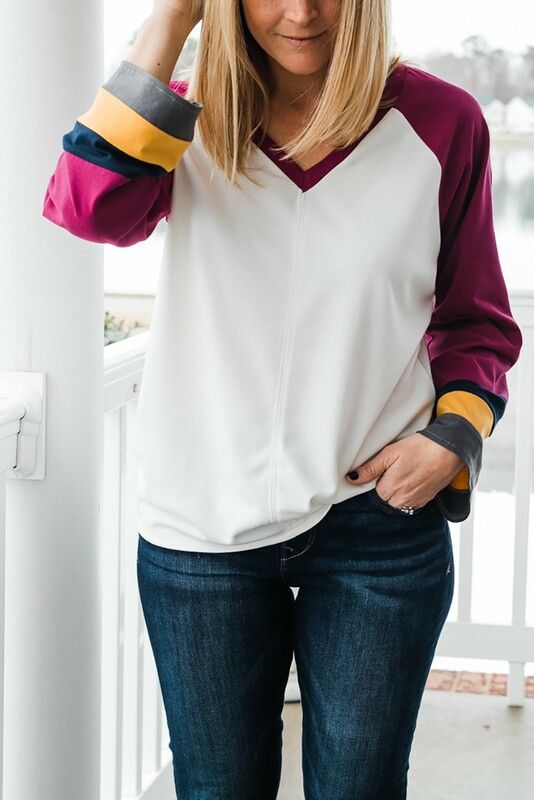 * Please note – I used the free raglan pattern by It’s Always Autumn found HERE. Lay out your front shirt pattern on the fold. Place it on top of a piece of tracing paper. Extend the front center fold line and neckline out 1/2″. Trace new front center line. Mark a straight line from the top of the armsyce curve, down to where you want your V Neck to end. 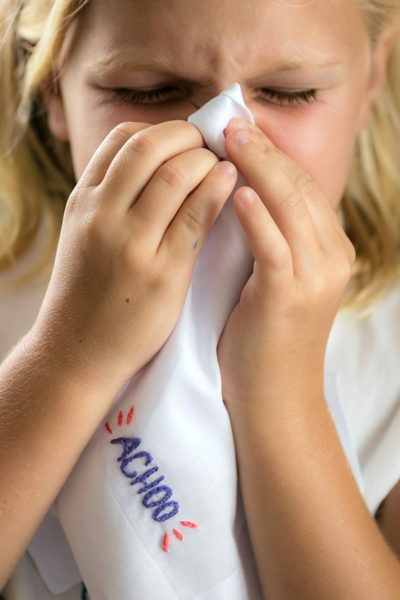 Trace around the rest of the pattern onto your tracing paper. Cut (2) Front mirror image pattern pieces, using your new traced pattern. You are NOT cutting the pattern on the fold. Place your sleeve pattern on a piece of tracing paper. Determine the bottom center of your sleeve cuff. Draw a straight line up the middle of your sleeve, until you reach an inch or two below the bottom of your armsyce. Cut. Spread open up your cut line, notice how the sleeve hem is wider, and the sleeve sides are arced out. Trace around the new sleeve pattern. Measure one quarter up from the sleeve hem and cut across. 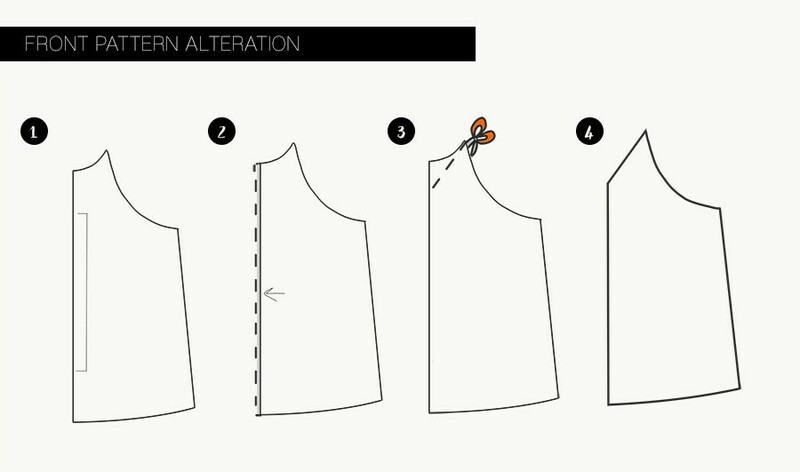 Using the piece of paper that you just cut off the bottom of your sleeve, cut the removed sleeve hem into thirds. 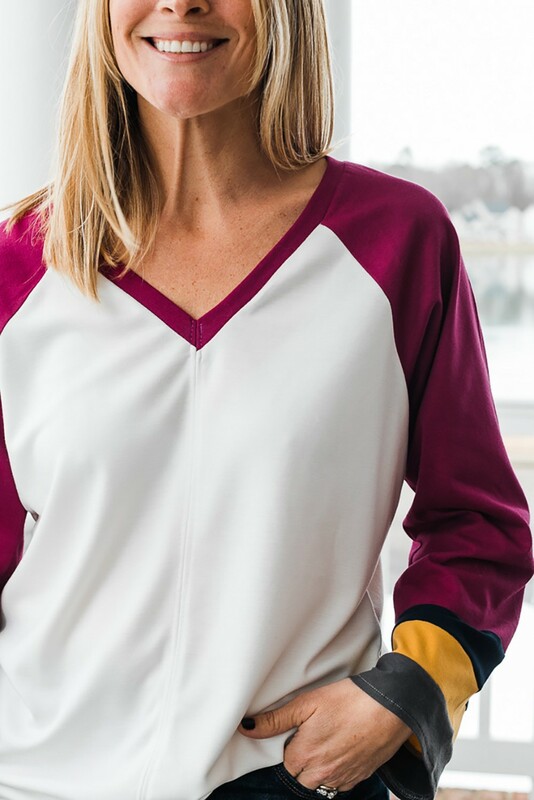 Add seam allowance on both sides to create your sleeve bands. Sew sleeve bands right sides together at the upper and lower edges. Finish seams and press. Sew triple sleeve band to bottom of sleeve right sides together. Finish seam and press. Repeat for both sleeves. 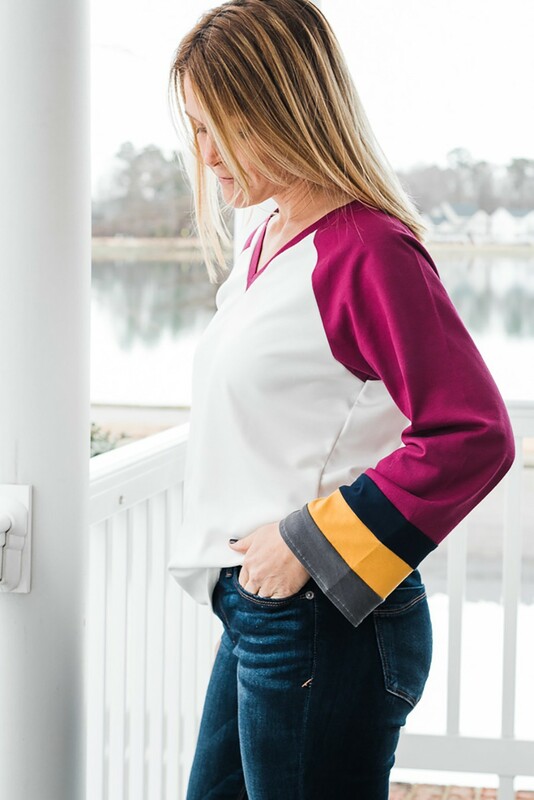 Sew raglan sleeves to both front and back of shirt where indicated, right sides together. Finish seams. 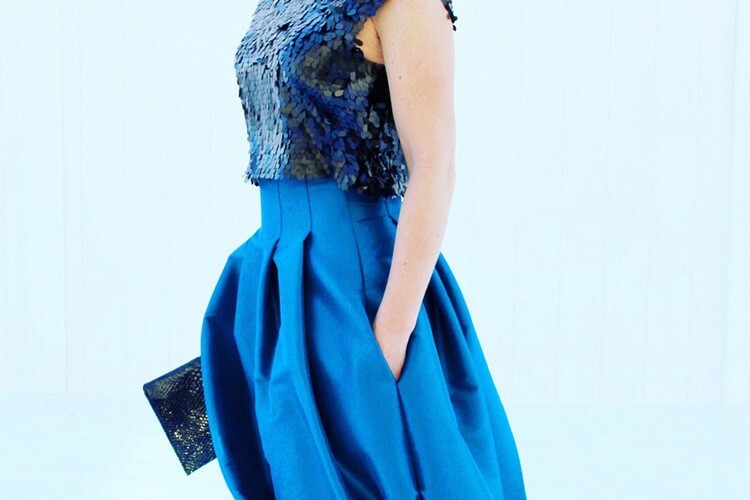 Measure around the neckline, and subtract 1.5″ from your measurement. Cut a piece of knit fabric (the same color of your sleeves) this measurement x 2.25″ wide. This will be your neckband. Fold neckband in half wrong sides together, with the long outer edge meeting up on both sides, and press. 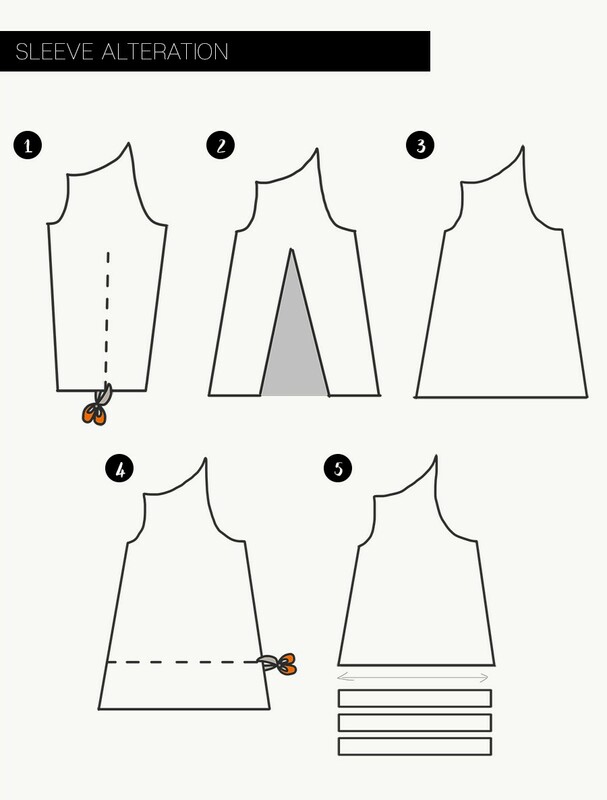 Pin the folded neckband edge to your neckline, right sides together. (Gently stretch the neckband when pinning, as the neckband is slightly smaller than your neckline.) 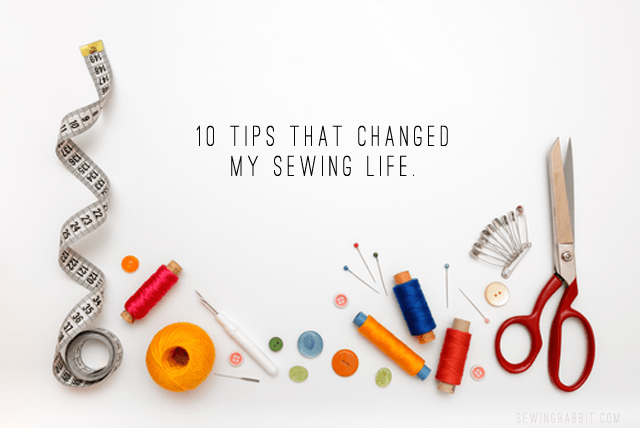 Sew using a zigzag stitch, stretch stitch, or serger. Press seam down and sew seam in place using a long straight stitch to secure. Place the left shirt front and the right shirt front right sides together, matching up the front center seam. Pin and sew. Press front shirt seam open and sew a straight stitch along both sides of the seam. Fold shirt together, matching up the side seams and underarm seams, wrong sides together. Pin side seams and underarm sleeve seam. Sew and finish seams. Finish sleeve hem and fold 1/4″ towards wrong side and press. Sew around to secure. Fold shirt bottom hem 1/2″ towards wrong side and press. Fold again 1/2″, enclosing the raw edge, and press. Sew around to hem. Where do you get your knits for shirts. I am anxious to try this one.